Th-INK-ing of You: For the Love of ODBD All time BEST SELLERS Hop! 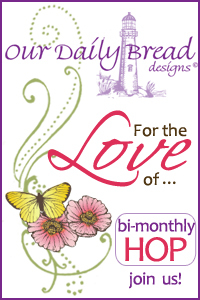 Welcome to Our Daily Bread Design's Alumni Team's For the Love Blog Hop. This week the Alumni team along with some of the ODBD designers are featuring a hop For the Love of ODBD Best Sellers! Check out each link and leave a comment. If you get lost along the way, check the ODBD blog for full list of links. One of the posts is a hop hot spot and a name will be drawn from that list of comments to win a $15 ODBD store gift certificate toward stamps. So, all you have to do is hop along and see all the creations and leave a little love! You have until Wednesday, January 2nd, at 6 pm. Enjoy all the beautiful designs featuring For the Love of ODBD Best Sellers! If you got here from Jan Keen's Lovely Blog you are in the right place! If not you might want to go back to the ODBD Blog and start from there so you don't miss a chance to win! 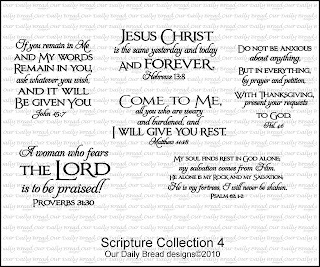 I used Scripture Collection 4 and specifically the Scripture I submitted for the set. It seems I need this constant reminder so it has become one of my favorite verses. NEWS FLASH: If you did not catch the post on the ODBD Blog, Kelley is generously offering FREE SHIPPING on any US order or 5.00 off any international order through midnight 12/22! Check it out HERE! I want to wish you all a most Blessed Christmas! I will be with family next week and will not have another post to share... so I hope to see you on Jan. 1 when we will be revealing what I honestly think is the most incredible release yet at ODBD!!! Thanks so much for stopping by, and now I'll send you to the next stop on the hop... my dear and so talented friend, Chris Olsen! Beautiful Grace! 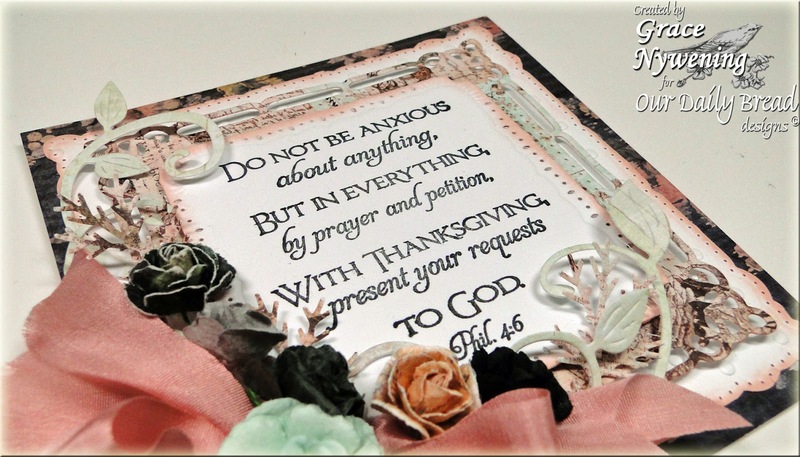 Love how you framed the scripture verse, the Prima flowers coordinate wonderfully with your choice of papers! How absolutely soft and beautiful!! I just love your layering of the dies, the sponging, the added texture, and the flowers. Gorgeous my friend!! Merry Christmas!!! Just beautiful, Grace and such a lovely way to showcase this verse! What a gorgeous card and color scheme wrapped around one of my favorite verses!!! Wow Grace....what a beauty of a card!! I just love how you framed this awesome verse!! wow on the colours, and use of dies!! STUNNING!! Wow - love all the layers! Gorgeous! Lots of gorgeeous details framing this fabulous scripture verse. Love the verse, love the colors! Gorgeous card! Thanks for sharing! Simply beautiful, both the card and the sentiment. A piece of Art. Should be put in a shadow box and put on the wall for all to see. Love the soft pink/grey theme with a touch of aqua. This is so incredibly gorgeous, Grace. I love the soft sweet bow and the delicate flowers. What a lovely creation, and I thank you SO MUCH for sharing this inour challenge this week at Word Art Wednesday. This is just wonderful, and it's always such a treat to see your delightful cards shared in our challenges. Oh, Grace...your work is always such a testimony of your faith, and of our glorious God's gifts of talent and 'grace' to you, my friend. As always, this card is stunning. When I need a calming moment, or an encouraging moment, or a moment to just sit and stare at beauty, I love to come here! Christmas blessings, sweet Grace! Enjoy your family - see you in 2013! Very pretty way to showcase this verse. Stunning card and a very precious scripture! This is so gorgeous. Love the soft colors. Great sentiment. soooo beautiful!!!! love the layers and the verse! Beautiful card Grace - may you and yours be blessed this Christmas! Love this scripture and your card is amazing. What an awesome Scripture verse and you have showcased it so well. Love the soft bow and flowers around the verse. Lovely card. Lovely, such pretty papers and matching flowers!! Love that die set for framing! What a beautiful card you have created and to boot I just love this verse. Grace, absolutely stunning as always!! Love these soft colours and stunning detailing!!! I'll miss you girl!! HUGS!! Grace, everything you create is perfection....you are my hero!!!! I love the colors, papers, and embellies you chose for this....one incredible card! Love and hugs!!!! Gorgeous layers on this beautiful design Grace! They perfectly frame that precious verse! Oh, Grace, this one just speaks to me! It's saying "I am beautiful"!! I can see why you love this verse set so much...and you have made a most gorgeous card with it!! A blessed Christmas to you too!! Another beautiful card. I like the flowers and colors you used. This is so elegant. Wow! This is gorgeous!!! Love the soft colors and the combination of dies you used. I love this set- love how you showcased it as well! Oh Grace..this is just so beautiful! Love the focus on the scripture. The flowers and ribbon accent is gorgeous! I just got the marvelous squares dies and now I can't wait to use them! Grace, you have showcased this bible verse so gorgeously! Love this card! This is wonderful! What great words of encouragement in the verse. The DP and inking are fantastic and I really love the added piercing! I love everything about your card. The colors, the layers, the verse and those gorgeous flowers. What more to ask for. Absolutely gorgeous! Thanks for blessing us with your artwork this week at Word Art Wednesday. Hugs and blessings. This card is awesome, love the color combo - the saying will have to be added to my "wish" list!! This is one of my fav verses and your card is so awesome! Love all the beautiful layers. Your card is so beautiful. I love the verse you used and your bow and flowers are stunning. Thank you so much for sharing! God bless! Such a beautiful card, from the sentiment to the paper piercing. Gorgeous! Perfect sentiment going into the New Year~thank you for sharing your gorgeous creation Grace!